We take great care in ensuring that our people have many opportunities to improve their health and wellness. We take great care in ensuring that our people have many opportunities to improve their health and wellness. Canadian Natural’s ‘Strive’ wellness program continues to show our commitment to ensuring employees have opportunities to improve their health and wellness, and prevent illnesses. Participation in Strive generates financial rewards that can be used to pay for healthcare or wellness expenses not fully covered by the Canadian Natural benefits plan. The program is offered to all employees in our Canadian operations (corporate headquarters and field), and at our International offices in the UK and Africa. Strive empowers employees to proactively manage and improve their health and wellness by developing healthy lifestyle behaviours that are sustainable, including: exercising, good nutrition and community based activities like volunteering. The program offers health risk assessments and personal health screening clinics at our offices to provide health information to participants, reflect their progress or changes throughout the years and provide a baseline for new participants. Other components of the program include educational videos, monthly health topics and various health challenges throughout the year. In addition to Strive, we provide specific education and carry out health promotion campaigns that relate to malaria, HIV/AIDS and Ebola for our employees working or visiting our operations in Africa. Read our 2017 Stewardship Report to Stakeholders for more highlights of 2017 wellness initiatives. 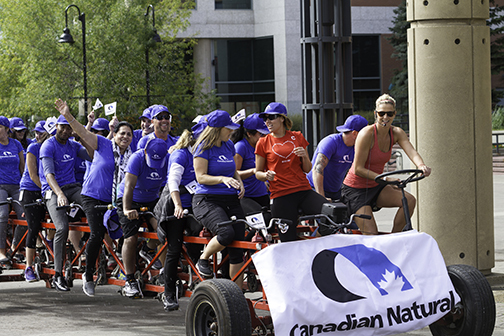 Canadian Natural encourages employees to stay active and support the community. The Big Bike ride event through the Calgary Corporate Challenge is an annual tradition.